I enjoy setting the tables differently each week. 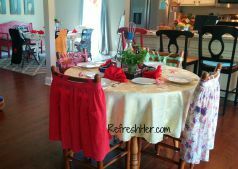 I used vintage half aprons on the backs of the chairs. They made a pretty slipcover and added a touch of whimsy. 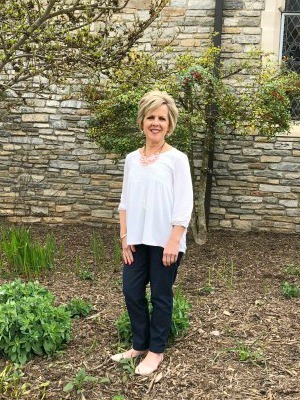 I’ve shared here about Apples of Gold, a mentoring ministry that revolves around the Scriptures and cooking instruction. The Lord has opened the opportunity to begin our second group of young women. (Happy Cheer!!!) We have had two lessons so far, and it’s been such a blessing. My heart is always so full when they’re here! It’s the joy of seeing this longtime dream and vision come true. Proverbs 13:19 says, Desire accomplished is sweet to the soul. How true that is! 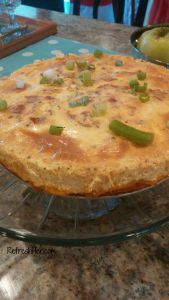 This quiche is OUTSTANDING! 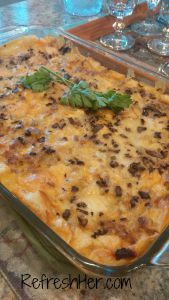 The cheddar grits crust substitutes the normal pastry crust and is soooo good! The egg mixture is light and fluffy – a perfect start to a great day!!!! My Notes: I did steps 1-3 a day in advance. This simplified the process greatly! 1. Preheat oven to 350°. Cook bacon in a skillet over medium heat until crisp. Remove bacon; drain and crumble. Transfer 2 tsp. bacon drippings to a saucepan. 2. Bring drippings, milk, and butter to a boil over medium heat. Gradually whisk in grits, 1 tsp. salt, and 1/2 tsp. pepper; cook, whisking constantly, 15 minutes or until very thick. Remove from heat; let stand 10 minutes. Stir in 1 cup cheese; let stand 10 minutes. Stir in 1 egg; spread in a 9-inch springform pan coated with cooking spray. 3. Bake at 350° for 25 minutes or until set and browned. Sprinkle remaining 1 1/2 cups cheese over warm grits, spreading to edges. Let stand 15 minutes. 4. Reduce oven temperature to 325°. Combine half-and-half, cream, onions, and remaining 5 eggs, 1 tsp. salt, and 1/2 tsp. pepper. Pour over grits; sprinkle with crumbled bacon. Place pan on a foil-lined baking sheet. 5. Bake at 325° for 1 hour and 15 minutes or until lightly browned and just set. Let stand 20 minutes. Run a sharp knife around edges of quiche; remove sides of pan. 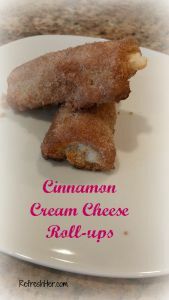 These Cinnamon Cream cheese roll-ups served as a little appetizer when the ladies arrived. They’d make a great dessert, appetizer or snack! They are inexpensive, easy and a great treat! Bake at 350 for 16-20 minutes until golden brown. Serve warm. This was not a low-calorie meal, but it was a mixture of things to introduce the ladies to different kinds of recipes, different cooking techniques, and prepping ahead. Brunch can be a fun meal to prepare, and then you won’t need lunch, so that makes the splurge a little less guilt ridden! I hope you’ll try some of these recipes. It’ll start your day of with a happy tummy! A heavy sprinkling of flour, measuring cups and baking ingredients were spread out on the counter. The mixer was whirring and the oven was hot. That pretty much describes my Saturday. And I loved it. 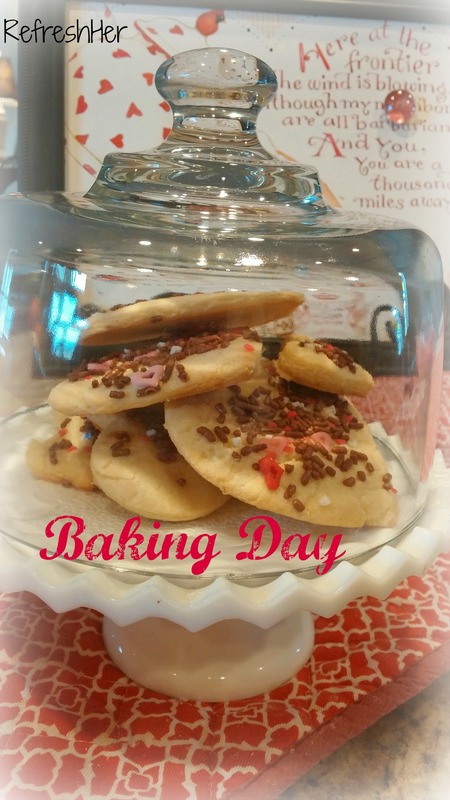 It was a Baking Day; one of my favorite kind of days at home! A holiday, a church banquet and company invited for Sunday dinner were all the reasons that I got to attend to this hobby I love! On my list of “To-Do’s” were Make-Ahead Butterhorns, Sugar cookies, Blueberry Pecan Scones and Salted Caramel Cheesecakes. 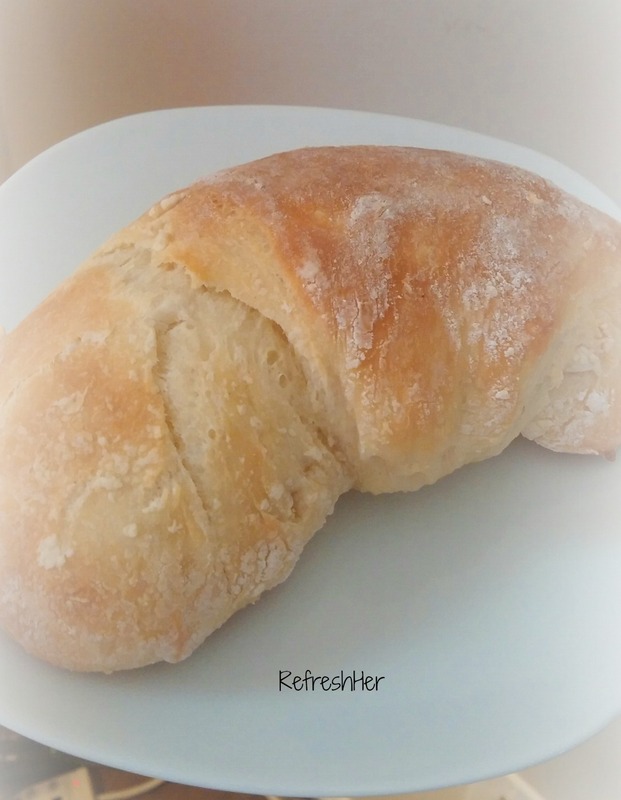 The Butterhorns are a fantastic roll to make and have on hand. The recipe makes 32 rolls. 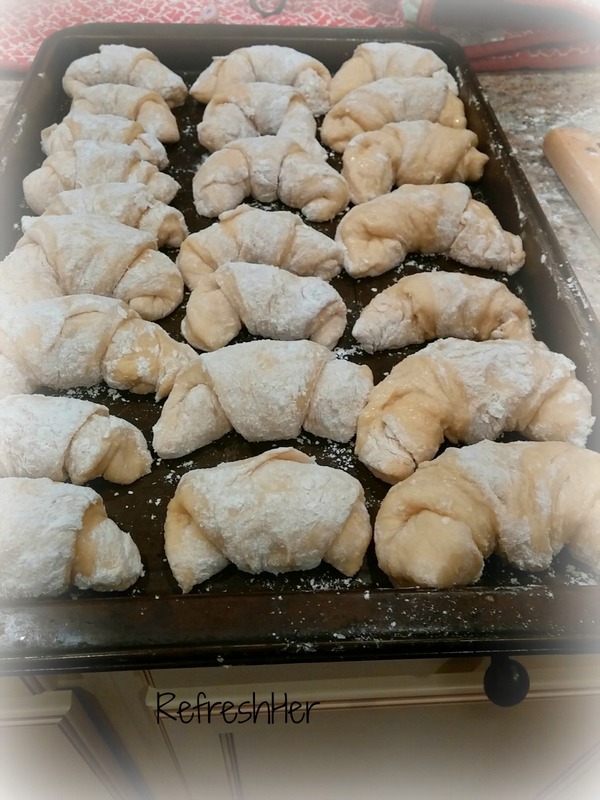 You make up the dough, roll them into their shapes, then freeze them until you need them. They just need several hours to thaw/rise. 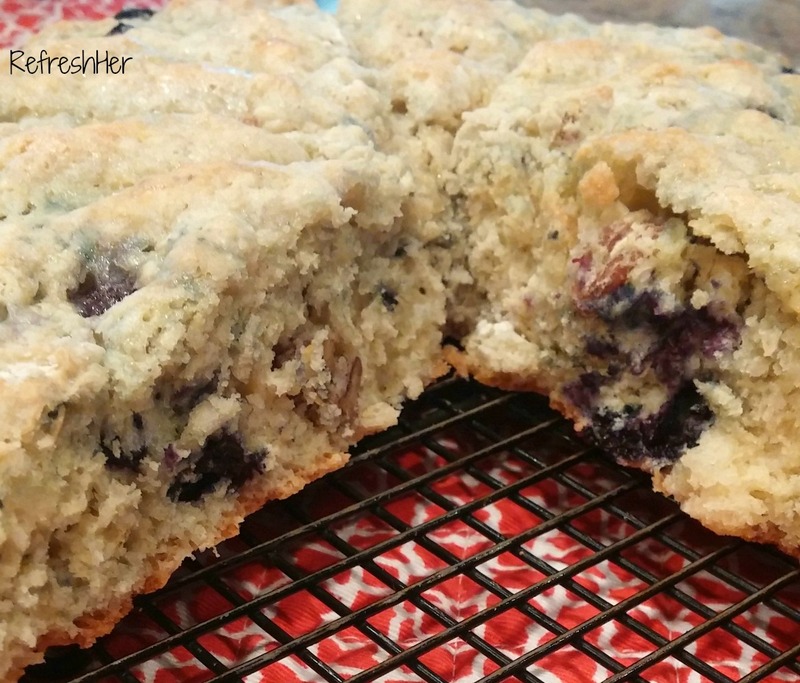 These are easy and so yummy! Frozen Rolls, ready to rise and bake. 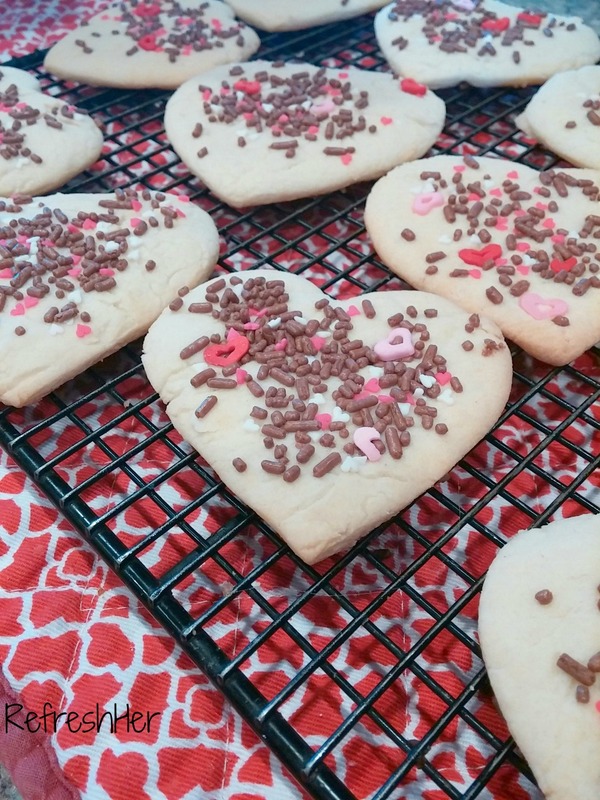 I made the sugar cookies for Valentine’s day gifts. I make these all year long in different shapes and decorations. 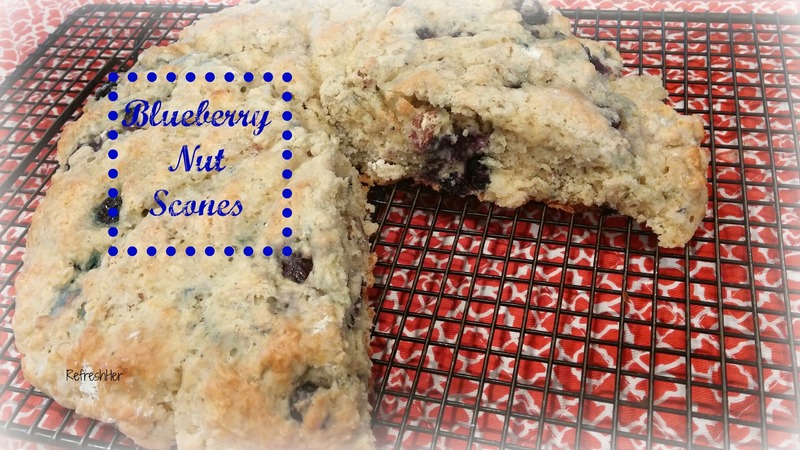 The Blueberry Scones were part of my Valentine’s Day Brunch. I found this recipe in my Cooking Light Cookbook. They were a perfect addition to the menu! Preheat oven to 375 degrees. Combine first 5 ingredients in a bowl, stirring with whisk. Combine dry ingredients. cut in butter with a pastry blender until mixture resembles coarse meal. Gently fold in blueberries and pecans. Add milk mixture, stirring just until moist (dough will be sticky). Turn dough out onto a floured surface. Pat dough into an 8-inch circle on a baking sheet coated with cooking spray. Cut dough into 10 wedges, cutting into, but not through dough. 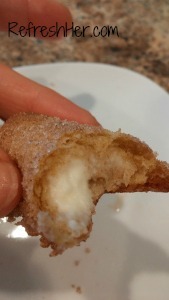 Brush egg white over dough wedges, sprinkle with 2 tbl. sugar. Bake at 375 for 18 minutes or until golden. Serve warm. Add a cup of coffee, a scrambled egg and a piece of turkey sausage, and you have the perfect brunch for Valentine’s Day, President’s Day, or an ordinary do-nothing day! Are you having a snowy day today? Days like that are great days to get in the kitchen and bake up something special. If you have the ingredients on hand, I hope you’ll try one of these recipes! Be sure to check here on Wednesday for a peek at the Salted Caramel Cheescakes I made. They’re pretty and scrumptious!